our customers can avail non contact displacement & measurement sensors from us. Linearity (+/-) 0.1% of F. S.
2 D Laser Displacement provides high-speed, high-precision measurement of height and width. Now you can perform whole-lot profile measurement on a range of production lines to ensure quality control of parts and materials. Offering superb high-speed performance and value for money, the FASTUS LS series handles high-precision 2D measurement applications that are not possible with spot beam laser displacement sensors. 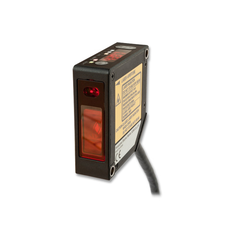 The LS series is a new generation profile measurement sensor that opens up a new category in the field of component measurement. CD 33 - Non Contact Displacement Sensor with ±0.1% F.S. linearity packed in a half-palm size, ideal for built-in use with OEM machines. It is available is CD33-L a Specular Types for high reflection and transparent object even in RS422 serial communications. Just connect UQ1-02 to build data logging system to PLC without any I/F, logging unit and ladder program. Analogue output 4-20mA or 0-10V + 2 control outputs Stand-alone design capable of direct operation without controller. Looking for Non Contact Displacement & Measurement Sensors ?